Today was a slackpacking day 🙂 I left the Osprey Hornet 46 rucsac at Fosters and ventured out with my Sea to Summit daybag. I hopped onto a bus to take me to Ferry Bridge so I could walk along the old railway line by the road to Portland Bill. The Portland end has been totally revamped for the Olympics. Seeing a diving type super store, I suddenly remembered it’s Jesus Green time again and I’ve been trying to find some neoprene swimming gloves for ages. In I popped and soon came out with a pair of T-Flex 2mm gloves from O’Three. 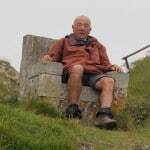 In Fortuneswell I came across two guys expertly descalloping scalops, fascinating to see skilled folks at work 🙂 Then it was the 300 foot climb onto the top followed by a pleasant walk along the cliff edges, I came across the best outdoor chsir come throne yet, and it was pretty comfortable. Really must remember to bring a small tripod next time, it’s so hard balancing the camera on piles of stones. I soon arrived at the end of the island with it’s three lighthouses and conglomeration of old sheds scattered at random. the Lobster Pot cafe did a mean crab sandwich 🙂 Out at sea there was a Navy cruiser lurking on the horizon no doubt the source of the clattering helicopter that was circling around all day. 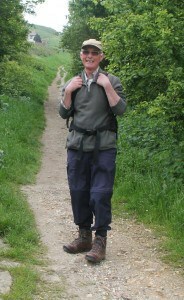 A really good day and would make a lovely15 mile walk for The Cambridge Rambling Club. Tomorrow is the penultimate day with a tough stretch of 20+ miles to Worth Matravers.